Well I guess everyone is wondering how things are going here at Casa Greene since my bedroom/office wall caved in. Not much has changed. We finally got someone to come and help us clear away the bricks but there’s still dust and dirt everywhere. I needed to restock almost all of my cleaning supplies for the PC and they ran out almost immediately when I started cleaning. Which means cleaning is temporarily on hold till more supplies come in, which means my main PC is still a nowomansland of dust and dirt and unidentifiable bits that I really, really, hope are dead bugs instead of giant droppings (if you’ve ever been curious about what’s going on inside of your walls, let me just tell you – you do not want to know.) This means I’m not on the computer I do most of my work from but back on the backup netbook which can barely handle keeping a copy of notebook open along with an internet browser – hence the late blog update and my lack of pressence on FB and Twitter again. This notebook is good enough for me to continue to revise “Ash of Ambitions” however so that’s continuing at a somewhat staggered pace (repairs and cleaning take priority, sadly) it’s still moving right along towards publication. When “Ash of Ambitions” publication date will be – I currently have no idea. We’ve covered the gaping hole with a piece of metal and some old boards we had lying around from a summer project. We did get lucky and the wall doesn’t seem to be open to the roof, so no rain is coming through (yay!) unfortunately it does go all the way down to the ground, so I’ve got cold drafts seeping up into my room and the constant threat of snakes deciding to spend the winter indoors (boo!). Thanks so much to everyone who has reached out by buying a book, contributing through paypal or even just reached out to me on Twitter and Facebook. The support has really meant the world to us! Now, back to the never ending war on dust. 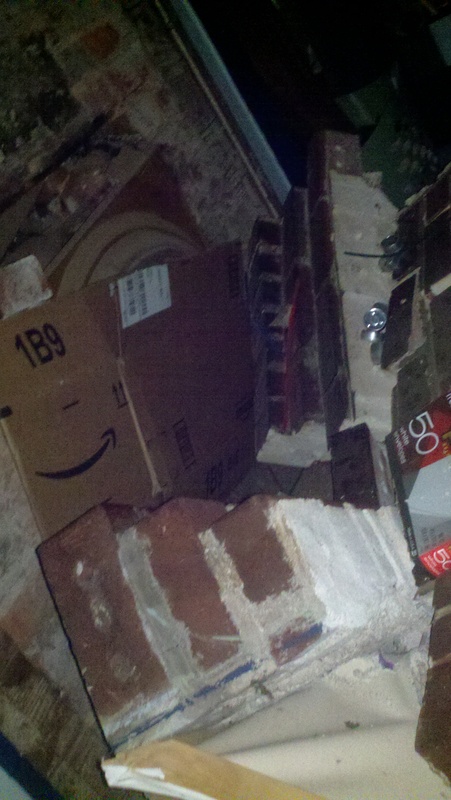 Last night at about 1 am EST, a large section of my bedroom/office wall fell in. No one was hurt and I’m extremely lucky as I was standing within a few inches of the area when it collapsed. The good news is, someone will have to be hired to make repairs and clear out the rubble (yay I’m helping the economy!) the bad news is most of my room will likely need to be dismantled (including my computer and desk) which will probably lead to further delays on all publications – and I’m not at all sure how we’re going to pay for repairs. I hate to say it but if you’re feeling particularly generous and would like to help, I have a donation button or I’d appreciate it greatly if you could see your way to buying an ebook. Family Picnic and The Uncertainty of Death are both just $.99 and every little penny right night would be a BIG help. Thanks for listening regardless. Now if you’ll excuse me, I’ve got to get started carting out big crumbling bricks one at a time in a little red bucket.